Bright light gold color. Fruity aromas of lychees, ruby grapefruit, rose water - petals, and gravel - volcanic dust with a slightly chewy, racy, dry medium-full body and a warming, complex, breezy finish with earthy tannins and no oak flavor. Textbook in face gewurz that doesn’t overwhelm your palate. Bottom Line: Textbook in face gewurz that doesn't overwhelm your palate. 82 • Sophistocrats 2014 "Bruno", Finger Lakes 11.7% (USA) $9.99. 85 • Sophistocrats 2014 "Jinx", Finger Lakes 11.8% (USA) $9.99. 88 • Sophistocrats 2015 "Charlie", Vidal, Finger Lakes 12% (USA) $9.99. 90 • Treleaven 2013 Gewurztraminer, Finger Lakes 13.9% (USA) $16.99. 85 • Treleaven 2013 Estate Bottled, Pinot Noir, Cayuga Lake 13.2% (USA) $19.99. 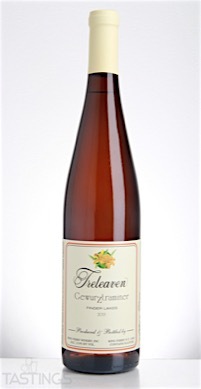 83 • Treleaven 2014 Semi-dry, Riesling, Finger Lakes 11.5% (USA) $14.99. 85 • Treleaven 2014 Merlot, New York State 12% (USA) $21.99. 89 • Treleaven 2014 Meritage, New York State 12.5% (USA) $25.99. 84 • Treleaven 2015 Tacie’s "Barrel Fermented", Chardonnay, Cayuga Lake 12% (USA) $14.99. 91 • Treleaven 2016 Semi-Dry Estate Bottled, Riesling, Cayuga Lake 12% (USA) $15.99. 85 • Treleaven 2016 Tacie’s Barrel Fermented, Chardonnay, Cayuga Lake 13% (USA) $15.99. 86 • Wobbly Rock 2016 Riesling, Finger Lakes 10.5% (USA) $13.99. Treleaven 2013 Gewurztraminer, Finger Lakes rating was calculated by tastings.com to be 90 points out of 100 on 8/19/2016. Please note that MSRP may have changed since the date of our review.